I said I’ll ride somewhere exotic so I did. 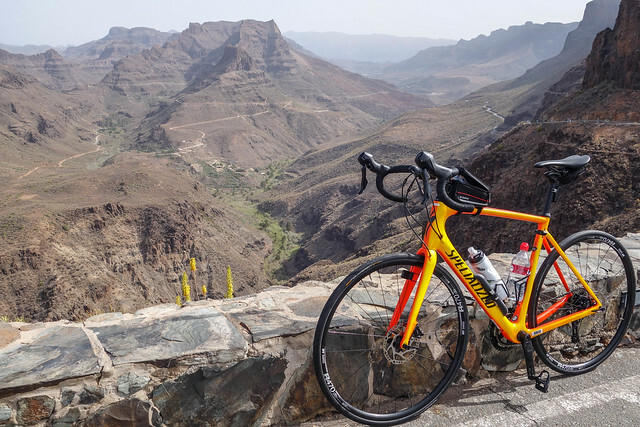 I’ve spent the last week with my DW on the Gran Canaria island. It was another attempt at a sport holiday (the last one failed spectacularly). 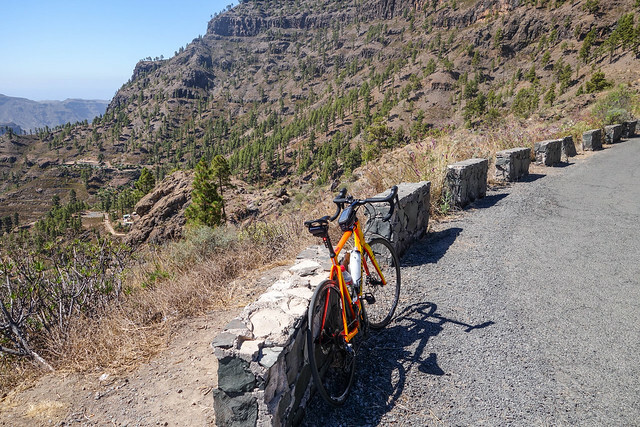 Gran Canaria enjoys a pleasant climate that’s conducive to both, doing sports and relaxing at the hotel almost the whole year round. So it’s not a surprise both of us had a great time. 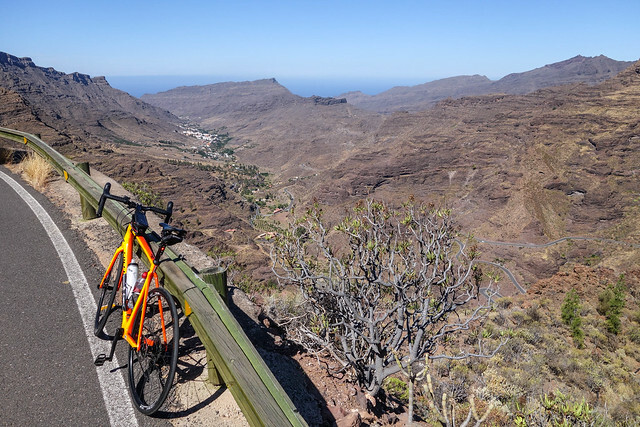 The goal was not to train or ride every waking hour but to combine cycling and the joys of traditional vacations, that is to swim, to lie on a sunbed and to savor an occasional culinary treat. For that reason I rented a bicycle and went for a total of 3 awesome rides. 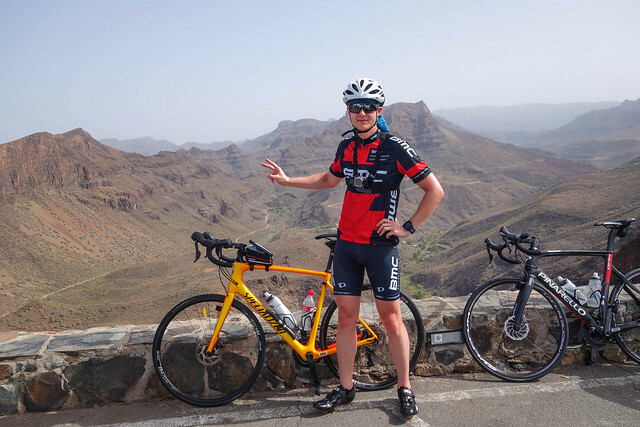 The bike business is handled professionally by the Free Motion chain and the offered bikes are top notch. While there were no Di2-equipped bikes left at the time of booking I was completely content with the latest disc-brake Specialized Roubaix. Well, except for the hideous shifters - these are huge due to incorporation of hydraulic cylinders. I don’t want that piece of ugliness on any of my bikes! The first tour felt hard. I’m not that used to cycle in 32C heat. I had a bit of a problem on the climb and even had to stop to catch my breath. The climb itself wasn’t particularly challenging but I think my cardiovascular system couldn’t adapt. I experienced no muscle pain or even high heart rate but had a kind of sick feeling. Gladly it went away quickly and from that moment on I rode faster and it felt good. The other problem were my shoes. Just like in the IronMan race they caused pain in the outer areas of my feet. I had to bear the pain but I must resolve this issue soon. As much as I like the fancy look of my Italian SIDIs I need a different pair of cycling shoes. SIDIs are too narrow for my feet although they seemed fine in the shop and according to their published measurements. Still, riding alone has its merits. Stopping to take a picture, for example. I did the last ride alone. While the guided tours always start at the Free Motion shop I decided to catch a taxi and start elsewhere. I took both wheels off and packed the bike in the trunk of a Mercedes. Taxi driver didn’t mind. The last ride left an overwhelmingly positive impression. It was a culmination of sorts. The ride was a bit shorter so that I’d have more time at the pool but the vertical challenge was in no way easier. Yet after the previous few days I was in better shape and felt energetic all the way from start to finish. The scenery is markedly different from Switzerland. It’s also an unusual feeling to climb high and feel as much heat as in the valley. In contrast, the passes in Switzerland are sufficiently high that you need a windbreaker to go down unless you fancy a cold. Besides cycling, me and my DW hiked, drove around a bit (driving windy roads makes us ill though), swam in the pool and in the ocean, frequented dining and cafe places and generally had a great time. As usual, none of this would happen without the planning and investigation of my DW. 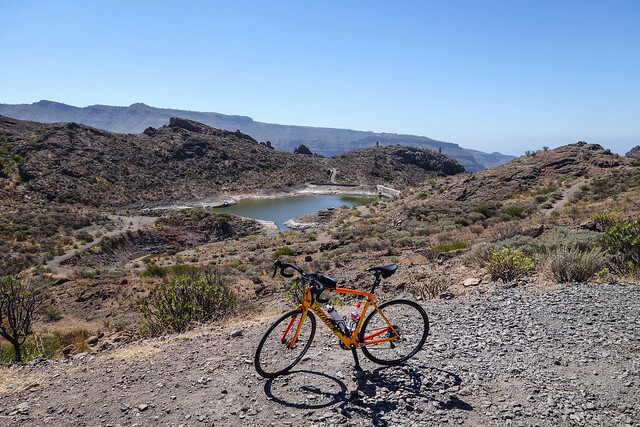 I liked Gran Canaria so much that I wish to come back again. Next time we’ll probably visit in winter and come for a longer riding session, maybe even for a bike camp.